Is it meaningful, or just movement? What: Shares of crowd-sourced review site Yelp (NYSE:YELP) dropped 13.4% in April, according to S&P Capital IQ data, as the company had a first-quarter trifecta of misses when compared with analyst expectations. 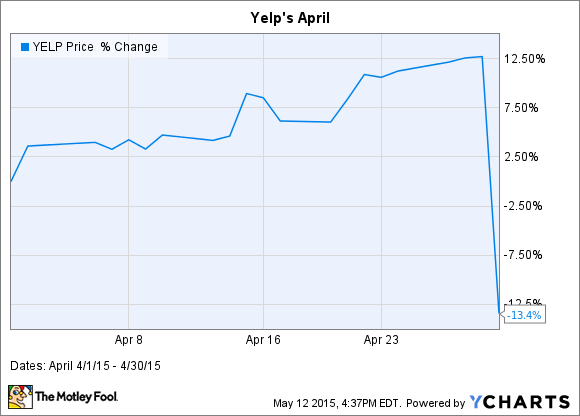 In revenue, earnings, and forward guidance, Yelp fell short of analysts' forecasts. Nervous investors sold off the stock to the tune of 20%-plus on earnings day alone. So what: For Yelp's first quarter, the company reported a net loss of $1.3 million, or $0.02 on a per-share basis, against Wall Street estimates of a narrower $0.01 EPS loss. On a top-line basis, the company reported revenue of $118.5 million against analyst expectations of $120 million. Perhaps the most ominous warning for the company going forward, however, was the slowdown in average monthly unique visitors. Overall, Yelp's average monthly visitors increased by 8% year over year to 142 million users, but that's down from previous growth figures of 30%. Desktop visitors decreased year over year by 3%, leaving mobile active user growth to pick up the slack. Now what: For Yelp, the issue is the business model is rather simple to copy. And while the company now has the advantage of name recognition and existing relationships, consumer switching costs are rather low. In addition, search giant Google has entered Yelp's advertising space with its Google+ advertisements, competing against Yelp in local advertising. Unfortunately for Yelp, Google also drives a significant amount of traffic to the site as well, making it both a competitor and a traffic driver. In Yelp's "risk factors" section of its quarterly earnings report, the company explicitly lists its reliance on Google's search engine as a risk factor. It should be noted that Yelp has regained many of its April losses on rumors of a potential buyout, but no buyers have confirmed the initial rumor. Possible acquisitions aside, Yelp appears to be underperforming on a monetization basis, with slowing user growth and dependence on an advertising competitor. I'm willing to watch Yelp from the sidelines.